“MAGIC SHINE” coloring book has 20 black and white unique illustrations and the metallic shine cover. The coloring book cover has protection with lamination and spiral binding. The book has a big size – A4 and has 160 gsm paper. The images are printed on one side of the pages. 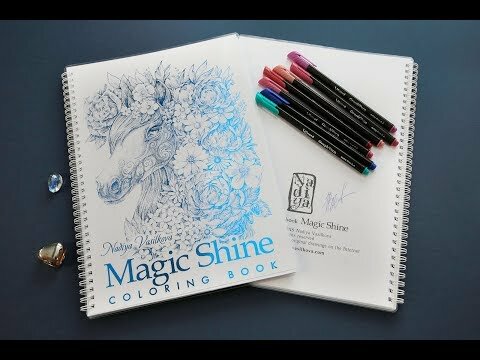 The new coloring book “MAGIC SHINE” with unique drawings for coloring. When creating the book, I took into account the opinions and wishes of my fans of coloring. Many beautiful portraits, animals, and flowers. I hope all the pictures will please you! Every book signed by the author! I ask you not to share the black and white images in any digital form, on Facebook, Pinterest, and other sharing sites. But you can share the pictures already colored you. This book is for your personal of use.